This is the first time I do colour-work and so far it’s going well. I’m at the “putting it together” stage now and I’m terrified. I just hope that I will be able to make this one. Some projects on the Go! I have a few projects on the go and jumping between them depending on how I fell and the one that has been waiting longest to be picked up again is a bag, a Mochila Bag. Next one is the Sólja Jumper. Next in line is the beautiful shawl “Longbourn” by Kay F Jones. Then to the second “Sommarväskan /Summer bag” by Järbo Garn AB and it’s not much to see at the moment. Then it’s the Christmas Scarf because Christmas will soon be here, so why not using a yarn with inbuilt tinsel ? And then to the latest project, a double think crocheted pot holder. So these are the things I’m having on the Go at the moment. 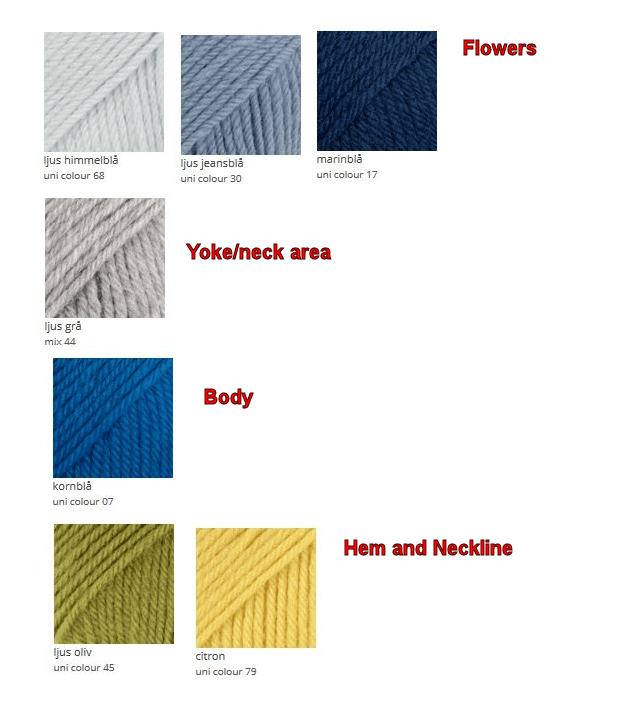 It’s time for me to finally knit a proper jumper! 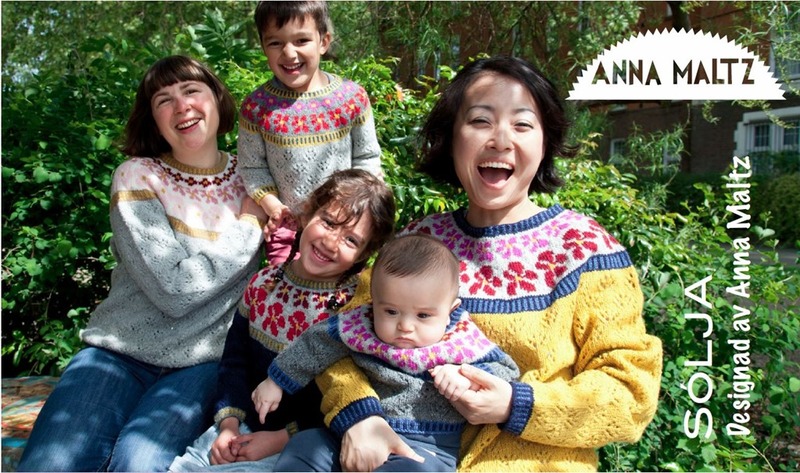 This is the jumper that I will be tackeling, The Sólja Jumper by Anna Maltz. The pattern can be bought on Ravelry. I will be making the left one with three rows of flowers on the yoke and the neck is higher up on that one. There will not be those colours because I wanted mine in blue, so here’s my choice. The yarn is Drops Karisma. The yarn has been ordered so all I can do now is wait. So what can I say about this one then ? Guess? I HATE IT! It did not take long before I put it back in it’s plastic bag and sold it off. So, I have bees seeing these for some time now on different podcasts and thought that “Why mess with things that already works?”. 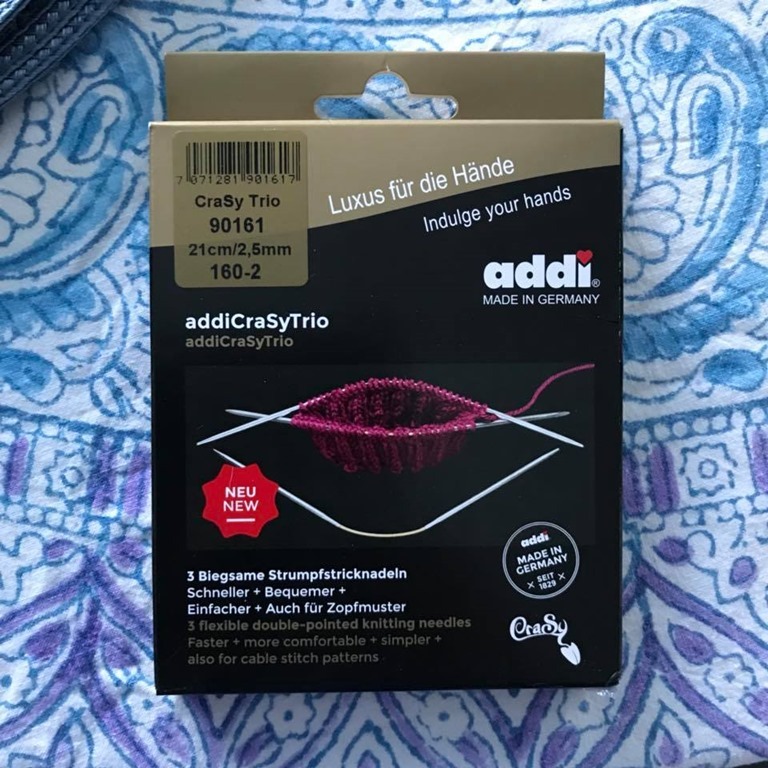 I am a DPN user and it works just fine for me and I have tried Magic Loop and hating it, so when I saw these I thought that this must be something in between them both. 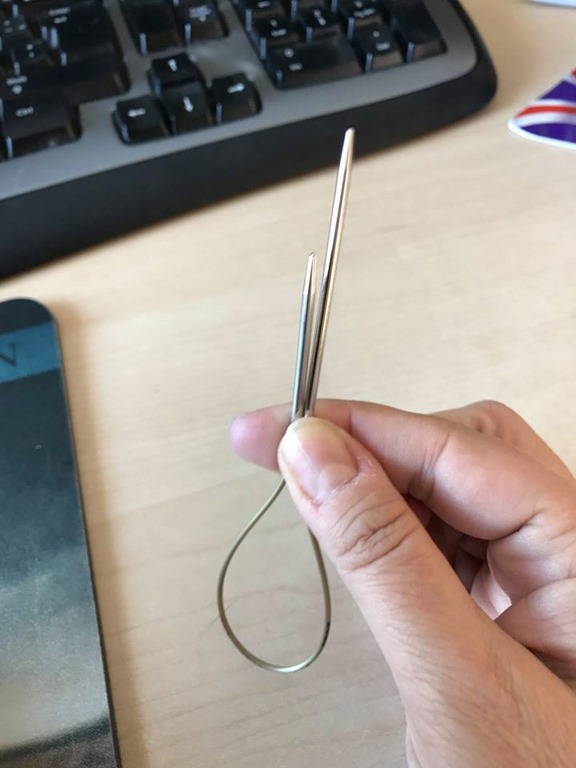 It’s still a bit Magic Loop when it’s on only two needles but you knit with the third but it’s more like DPNs because lots are using only three needles and knit with the fourth (I use four and knit with the fifth). So after seeing some podcasters talking about them and showing how they work and and some YouTube films I decided to give them a try. 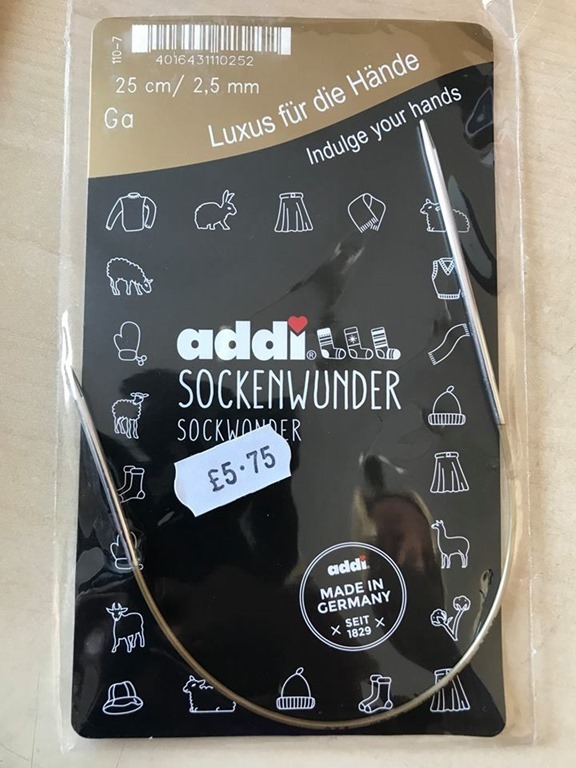 So I ordered a set in 2.5mm (US 1½) and when they arrived I tested them on the spot by casting on a pair of socks. They were a bit fiddly in the beginning but that’s everything when you try it for the first time, but after a few rows of the ribbing they started to slowly work for me. 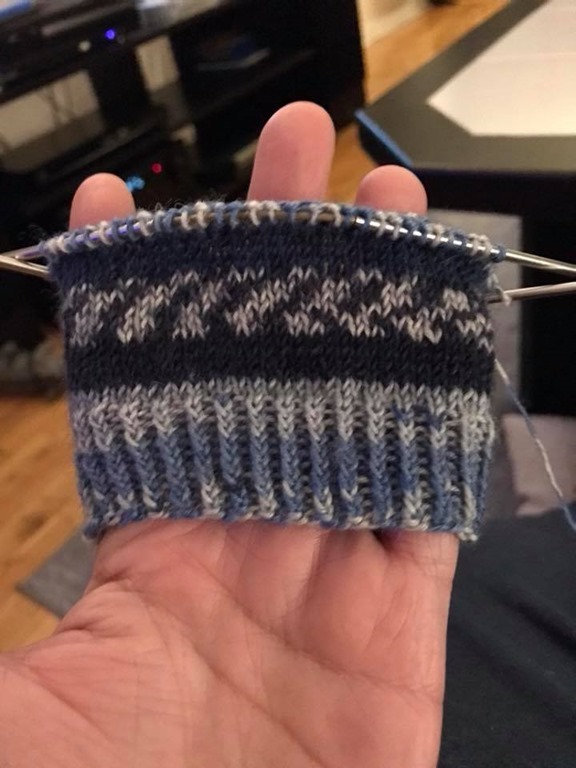 The yarn shop in Uppsala (Yll o Tyll) was holding a KAL, making a pair of socks by making stripes by knitting from the inside of the ball and the outside of the ball. The only problem I had by making these was all the ends to weave in after and there are 14 ends!!! 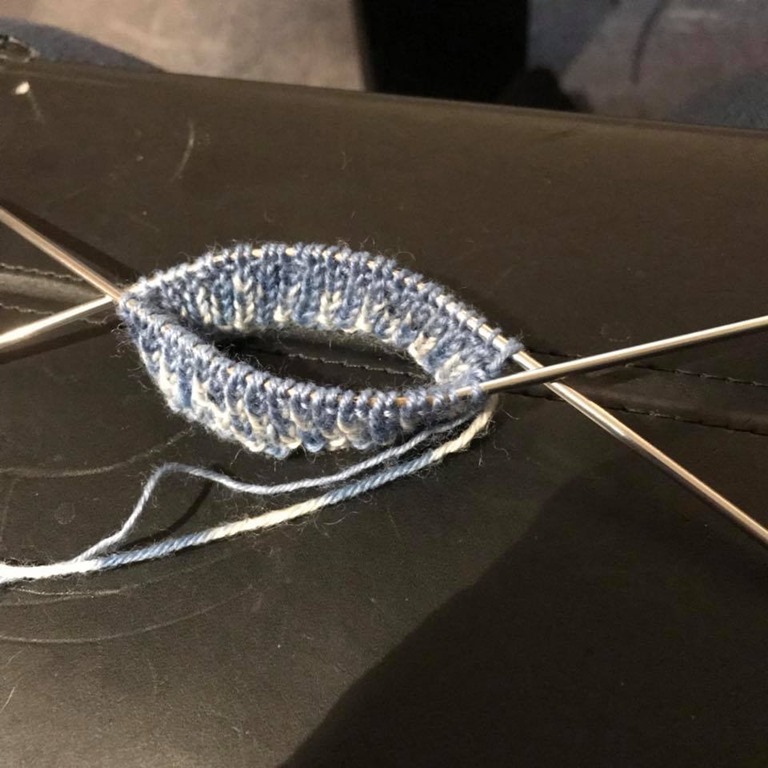 I also learned to make a short row heel and I did not like the progress of it but the fit is brilliant, so I guess I have to practise this a bit more.. I did get some yarn from my mother-in-law for my birthday so I had to make something out of it. I started with a yarn I never tried before but I loved the colour of it and that it had copper metal thread in it for some sparkle. So what can you knit out of a 50 gr ball that have 100m in it? I had no idea! So Ravelry to the rescue and there I found a fingerless mitten that was made in the same yarn and I have never made fingerless mittens before so this would be interesting to see if I could do it. I did! and I loved them and so did my husband and wanted a pair and another friend of mine ordered a pair as well. The pattern is a free one and by Lisa Beamer Cannon (on Ravelry) and the pattern is called “Fast & Easy Fingerless Mitts v2 – Circular”. This pattern is really fast & Easy and here are the ones I made. First up are these Aubergine /Brown ones for me. Yarn: Rico Design Creative Melange Glitz Chunky. 50 gr, 100m (109.4 yards). Next pair for a friend. Yarn: Rico Design Creative Melange. 50 gr, 90m (98.4 yards). Last pair for my husband.